Deeper Learning 2015 just gets better and better! For Day 2 of the conference, I participated in the Deep Dive hosted by Mark Hines of Mid Pacific Exploratory on Pedaling Towards Sustainability. I and the other members of my team, Andrew from The Met in Providence RI, Nate from Poudre High School in Colorado, and Robin from ReadyNation got the chance to think about how design projects centered around bicycles and sustainability can be used to unpack major concepts in physics, math, and the humanities while engaging students in authentic building, problem solving, and teamwork (STEM!!!!). For my part, I enjoyed the opportunity to literally get my hands dirty learning to take off and put back on key functional parts of a bicycle, including the front tire, back tire, chain, and seat (prior to today I really knew NOTHING about bicycles….). As we did so, under the tutelage of bike enthusiasts Nate and Andrew, our group challenged each other to identify key physics concepts – like torque, friction, angular momentum, elastic and inelastic collisions, momentum, etc – that could be wrestled with through the sorts of assembly and construction principles required to create a functional bicycle. Some of the redesign challenges we came up with: modifying and optimizing gear ratios for different topography; designing a reusable, miniature instant tube inflator; optimizing tire design for road surface conditions; and optimizing tube air pressure dependent upon climate conditions. 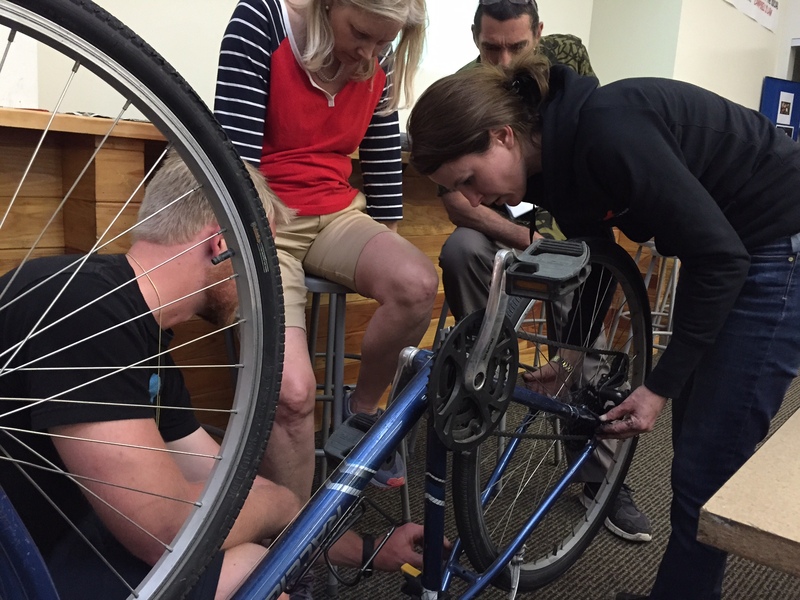 My teammate Andrew took this picture of Nate teaching Robin and I how to detach and reattach the back wheel of a bicycle. Mark Hines observed our progress. 1. To begin thinking about how we can purposefully coach students to examine the relative strengths and weaknesses of each team member to maximize learning for all. For example, Nate knew a lot about bikes and is an engineer, and I had experience with the structure and format of the Next Generation Science Standards, so we deliberately chose to work together so that we could “trade” expertise. He helped me understand the mechanics of the bike and I gave him a primer on the layout and structure of the NGSS. 2. To plan for novel ways for students to “show what they know.” We were supposed to create an artifact by the end of the dive to demonstrate our new learning. I knew that I had learned something new that I found valuable – but I didn’t have an external physical thing to show it. My solution (seriously…) was to use this blog as my artifact! Given that ongoing reflection is a key component for project based learning, this seems like an amazing two or three birds in one stone. I am reflecting on what I learned, articulating what I learned, and showing it with pictures!! 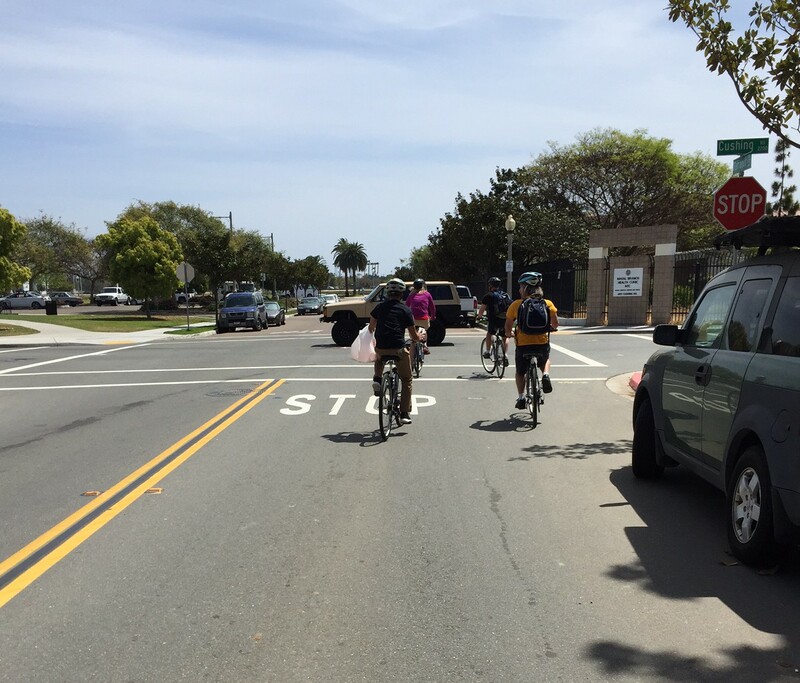 And as part of it all we even got to go for a ride through beautiful sunny San Diego! We even got to hit the road on our bicycles! Pingback: What is deeper learning all about?